Japanese companies that conduct much of their business in China, as well as about a third of the listed companies on China’s stock exchanges, have reported a drop-off in profits in 2018 compared to a year earlier. 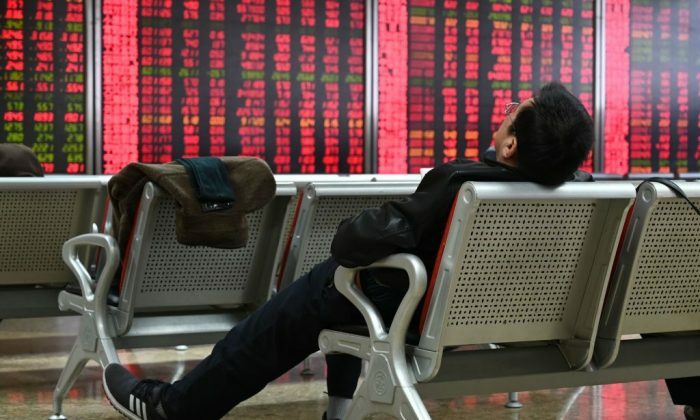 China’s slumping economy and the ongoing Sino–U.S. trade war were major factors in the decline. Japanese media Nikkei recently reported that the Nikkei China Related Stock 50 index—a stock index of the 50 most active Japanese firms expanding in China that are listed on the Tokyo Stock Exchange—dropped 8 percent on the year for three consecutive quarters ending in December 2018. The decline was steeper than the 2.9 percent drop for Japanese companies overall on the Tokyo exchange. The profit forecast for 2019 also shows a similar trend, according to Nikkei’s estimates, with these 50 China-active companies expected to encounter a 4.9 percent decline, compared with a 0.1 percent drop for Japanese companies overall. In China, 1,070 of roughly 3,600 listed companies reported a decline in net earnings for 2018, according to Nikkei’s calculations, based on year-end reports that Chinese businesses were required to file by the end of January. Among the 1,070, more than 400 were expected to report a net loss for the year. These listed companies are from both the Shenzhen and Shanghai Stock Exchanges. Chinese automakers notably suffered big drops in profits compared to a year earlier. According to Nikkei, total new-car sales dropped 2.8 percent in 2018 to 28.08 million units. Beiqi Foton Motor, a subsidiary of the state-owned auto company BAIC Group, registered a net loss of 3.2 billion yuan ($475 million) in 2018, compared to a net profit of 111.9 million (about $16.6 million) in 2017. Two other state-owned automakers, Chongqing Changan Automobile and Jiangling Motors, reported a 90 percent drop in net income in 2018 compared to a year earlier, according to Nikkei. Private automakers didn’t fare better. Geely Automobile Holdings reported a sales decline of 40 percent in 2018 compared to a year earlier, while its 2019 sales forecast of 1.51 million units is just marginally higher than the 1.5 million units sold in 2018. The transportation sector also took a hit. Cosco Shipping Holdings, a subsidiary of China’s state-owned China Ocean Shipping Company (COSCO), saw a 50 percent decline in net profit in 2018, according to Nikkei. Two international airports in Shanghai, Hongqiao International Airport and Pudong International Airport, also had lower international cargo handling volumes on the year since September 2017, Nikkei reported. Two of China’s state-owned airliners, China Eastern Airlines and China Southern Airlines, both reported a roughly 50 percent drop in net profit compared to 2017. According to Nikkei, the losses resulted from higher fuel prices and a weaker yuan. Meanwhile, China’s biggest insurer, the state-owned China Life, said a slump in the asset-management business would result in a 50 to 70 percent decline in annual net profit for 2018. Chinese telecoms giant ZTE reported a net loss of at least 6.2 billion yuan (about $919 million) for 2018. ZTE’s woes weren’t unexpected, given that the company was slapped with an export ban by the U.S. government after being found guilty in April 2018 of breaking agreements related to its prior violations of U.S. sanctions against Iran in 2017. The company nearly went out of business until it agreed to pay a $1 billion fine in a deal to have the ban lifted. According to Nikkei, many small and medium-sized companies in China are also struggling in the face of a credit crunch as Beijing tightens on lending to reduce excessive debt.